This is the second book in the “Stillhouse Lake” series by Rachel Caine. I really enjoyed the first novel. However, it did end with a cliffhanger which normally would have driven me up the wall. Thankfully I had this book ready to go. Although this could be read as a stand-alone book, I really think it would be much more enjoyable if you read the first novel too. Having the background of the story and the characters would definitely add to the enjoyment. She must keep her children safe. She thinks she has people around her that she can trust, but if the past has taught her anything…it’s that she needs to be very careful about who she trusts. Everyone has secrets. Even her children, Lanny and Connor, seem to be hiding something. What aren’t they telling her? In the back of her mind, Gwen always knew Mel’s reign of terror wasn’t over. But she’s ready for him this time. She’s not meek and subservient Gina anymore. Gina would have been afraid of Melvin hunting for her… but Gwen? Gwen isn’t going to hide anymore. Let him come. She’s not going down without a fight. In the first novel, the story was told from Gwen’s point of view. However, this book has many pov’s. This worked out well for me and I especially liked hearing from Lanny and Connor. I think the author did a great job of portraying how conflicted they were. Most thrillers would probably be boring if everything was entirely believable, but there were a few things that I thought were a bit over the top. However, I was completely engrossed in the story, flipping pages as fast as I could. As with book one, there are some pretty violent and graphic scenes…but again I was able to skim over them without missing much of the plot. 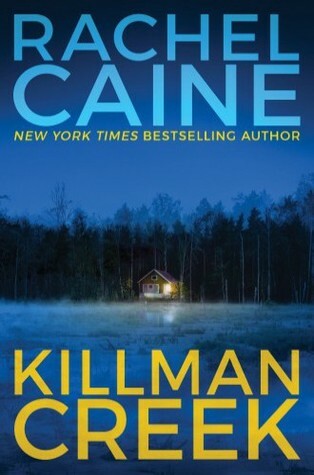 “Killman Creek” was a heart-pounding, dark and intense read. Book one in the series was intense but I felt like this one took it up about twenty notches. This is the kind of book that leaves you drained and exhausted after you’re done reading….but still satisfied. I just wish I had the next book in the series. I can’t wait to see what happens next! I’m *so* excited to read this!! Gwen was such a refreshing protagonist, and I can’t wait to see more of her. But I also love that it’s got more POVs than just hers. I’m so glad you enjoyed this one 🙂 Great review – it makes me want to read it all the more! I thought the change to multiple pov’s worked really well too and I can’t wait for the third book either! This is an author I’ve been wondering about since I’ve read some of her YA stuff, and always thought of her as a YA author (unfair of me to box her in like that, I know). Glad to hear you enjoyed this series. Putting Stillhouse Lake on my TBR (assuming it hasn’t snuck on there already).